Ballet is known to refine balance, flexibility and core strength and the health benefits of dance, especially ballet, are well documented, but what motivates a grandmother from Dundee, KwaZulu-Natal, to put on her pointe shoes again after forty years? Once a ballet dancer, always a ballet dancer! Ezit Froneman, is a passionate ballet dancer and her tale is an inspirational journey driven by commitment and dedication. Ezit started ballet with Dinky Goldberg, a Royal Academy of Dance teacher, at the age of seven when she moved to Port Elizabeth in 1962. 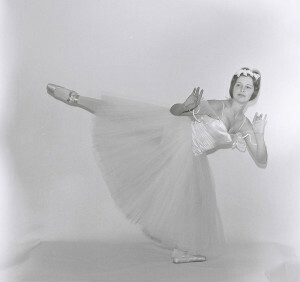 When Dinky Goldberg retired in 1968, she moved to the very strict Dame Maisy Louden-Carter, noting that “Where Dinky Goldberg instilled the love for ballet; Maisy Louden-Carter drilled technique and discipline into me”. Then, in 1972, she continued her training with Norma Blakeway who combined all the disciplines of ballet. After she matriculated, Ezit attended the University of Port Elizabeth and tried to carry on with ballet at the same time. She even attempted to do her Advanced in 1975, but her priority was to get her University degree. She did however do Spanish Dancing and passed her Grade 5 exam with Margieta Marx. Since graduating from University, she has done Aerobics, a little bit of Modern Dancing and started and ran a Gymnastic Club, but never taught ballet. Then in 2012 she starting attending Pilates classes in Dundee and it was here that her friend, Sharon Burns, heard of her previous ballet history and invited her to attend a ballet class with DASA teacher Sulindi van Wyk. At first she though it would just be for fun, but everything just fell back into place and she soon realised that she could cope well enough to try major exams again. The first challenge was the Intermediate exam, and then, after more than forty years, she danced her Advanced 1 exam which she passed with Distinction. “At my age it takes a bit more discipline to keep in shape and diligent training is essential,” Ezit concludes. Ezit continues to prove that by sheer will and determination, and by never giving up, you can achieve your goals. Hi my name is Lizzy and I live in Amanzimtoti KZN. I am 19 years old and would really like to go further with my ballet. Could you please give me more info and tell me where the closest studio is? Hi Lizzy, thank you for your comment. Please see our Contact Us page for a list of teachers in your area. For contact details you can email info@dasa.co.za or call 012 993 1216.